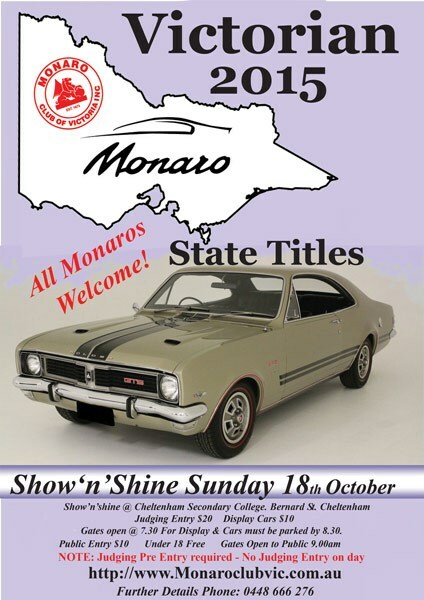 The Monaro Club of Victoria will be hosting its biennial Victorian Monaro State Titles at the Cheltenham Secondary College on Sunday, October 18. The day is open to all models of Monaros and with more than 100 cars showcased at the 2013 event held in Clunes, there's sure to be a great variety on display. Gates open at 7.30am for display cars and public entry is from 9.00am until 3.00pm. Admission is $10.00 for adults and free for children under 18. Display car entry is $10.00 (non-judging entry). Trophies will be presented across 22 judging categories for pre-registered entrants. Food and trade stalls will be available on the day, plus there will be a club merchandise stand. The Victorian Monaro State Titles is held every second year, so don't miss it!